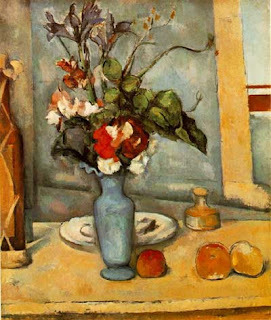 Paul Cezanne, Le vase bleu c. 1885-87, Oil on canvas, 24 x 19 5/8 in, Musee d'Orsay, Paris. Seven: I definitely want to be an artist when I grow up. Me: That would be wonderful! Seven: I want to be an artist and make art that will go into the museum where HFRM#1 works! Aside fact: HFRM#1 works at the Walker Art Center. Seven: I want to specialize in pictures of flowers in vases.